Unfortunately stress is something that most individuals are used to. Whether it be some kind of stress experienced at the office or in your personal life it is rather unavoidable. It may be one of those days where nothing goes to plan or you may be smashing goals at work and still experience some form of stress. This stress can affect our bodies in an enormous way. But it's not all negative, there is such a thing as 'good' stress or "eustress". Researchers describe this as "a positive form of stress having a beneficial effect on health, motivation, performance, and emotional well-being." So, whether you are enjoying your day at work or not an element of stress is involved. While this can sometimes be beneficial there are some ways to help manage the impact of stress on our bodies. This may seem like an obvious tip but it works. 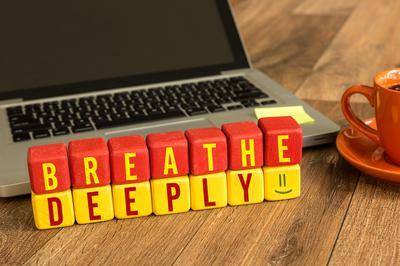 When you start feeling like the day is getting out of control or you are overwhelmed with work take some deep breaths. Within a minute you should notice a difference, even on the most manic of days. Recently Doctor Sharon Melnick told Forbes Magazine “everyone feels overwhelmed and overly busy". “If you’re feeling overwhelmed or are coming out of a tense meeting and need to clear your head, a few minutes of deep breathing will restore balance,” she said. “Simply inhale for five seconds, hold and exhale in equal counts through the nose. Just as Elsa sings about we should let go of things that our out of our control. Instead of reacting to things that we cannot control and riding the whirlwind, Dr Melnick says we should "act, rather than react." Try not to worry about things that are out of our hands and try and identify what aspects of the situation you can control. “We experience stress when we feel that situations are out of our control,” Dr Melnick said. “It activates the stress hormone and, if chronic, wears down confidence, concentration and well-being. “Typically, you’re in control of your actions and responses, but not in control of macro forces or someone else’s tone, for example. This is not something that can be achieved overnight and will require practice. Easier said than done right? But as Dr Melnick comments, "most of us are bombarded during the day". “Phone calls, pop ins, instant messages and sudden, urgent deadlines conspire to make today’s workers more distracted than ever. “While you may not have control over the interrupters, you can control your response,” she said. While it may be difficult prioritise your workload and if you don't have time to talk to someone or respond to questions right away let them know. Simply saying "I'll get back to you when I have a free moment" allows for recognition on their behalf and won't cause you to lose momentum. “You can also train those around you by answering emails during certain windows, setting up office hours to talk in person or closing the door when you need to focus,” Dr Melnick said.